This purse is big enough for everyday use – not that tiny evening bag style we’ve become accustomed to. 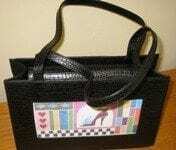 This Lee bag is stylish, easy to carry over your shoulder if you want and I have it in alligator magenta. This is no longer available from Lee or Colonial at this point. Any of the BR canvases will fit.